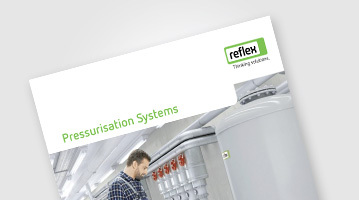 Variomat pressurisation systems maintain pressure by means of a pump in the hydraulic system. When the set pressure is exceeded, the overflow valve opens and releases water from the system into the expansion vessel. The water in the vessel increases and the pressure in the system drops. When the pressure falls below the set pressure, the pump switches on and pumps water from the expansion vessel into the system: the water content in the vessel drops and the pressure in the system rises. 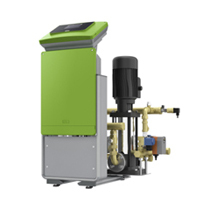 In the Variomat, degassing is part of the performance range. A partial flow from the system is routed into the expansion vessel by a timer and de-pressurized there. Released gases escape under slight overpressure through a special fitting. The nominal volumes of the tanks are between 200 and 5,000 litres, while special sizes of up to 10,000 litres can also be supplied on request. 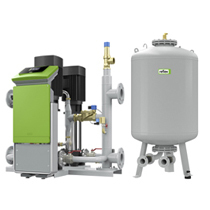 The control unit acts as a combi-device for maintaining the pressure with 1 or 2 pumps as well as discharge valves (as motorized ball valves with patented activation for automated hydraulic adjustment). For particularly high outputs and pressures. The nominal volumes of the tanks are between 1,000 and 5,000 litres, while special sizes of up to 20,000 litres can also be supplied on request. An additional solenoid valve ensures a minimum pressure release. The Variomat Giga can be built as a special system, for safety temperatures > 110 °C and > PN 16 in accordance with EN 12953 and TRD 604 p. 2.